Many of us go through the day using devices without giving much thought to how they function (until they stop working!). 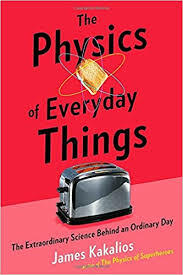 The Physics of Everyday Things takes the reader through a typical day and breaks down the science of how things we interact with actually work. The book is divided into chapters such as "You Begin Your Day" (covering devices you will encounter at home), "You Drive into the City" (which discusses how your car engine works as well as how you find your way using GPS), "You Check into a Hotel" (motion detectors and key cards), etc. The scenarios cover how you might come to encounter something like a refrigerator, wi-fi or a microphone in daily life and then goes on to describe the various mechanisms involved. I knew I was in trouble when, in discussing the humble toaster, the author stated that in order to comprehend how a toaster actually works, you need "an understanding of thermodynamics, electromagnetism and quantum mechanics." Oh dear . . . The author does attempt to make the concepts accessible to non-scientific minds (such as mine) by using analogies we can all follow, such as comparing semiconductors to an auditorium with some empty and some filled seats. The descriptions are still a bit hard to follow though, such as this randomly chosen sentence discussing digital photography: "The positive voltage that emptied the first capacitor at the end of the row will attract the electrons that are held in the second capacitor until all of the electrons that were on the second capacitor have swung over to the first capacitor and swung again, to the reference capacitor . . . ." There are some drawings scattered throughout the chapters to make the concepts a bit clearer. I'm sure that people who are interested in how things function will be fascinated by the explanations of how physics impacts our daily lives. I'm choosing to remain blissfully ignorant, though, and will just continue to plug things in and trust that more scientific minds than mine have figured out how to make all this stuff work!